In a move that’s sure to spark debate in golf clubs all around Ireland about the integrity of the game, the Annual General Meeting of the Golfing Union of Ireland has approved the use of distance-measuring devices for all competitions including its championships. Those in favour will argue that it will speed up play and lead to more enjoyment of the game. Those against will say that it will simply add to the cost of playing an already expensive game. 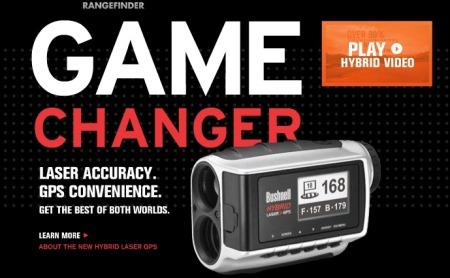 If your opposition is using a range-finder, you may feel obliged to buy one too instead of relying on an old-fashioned strokesaver. Those who are rubbing their hands with glee and planning to head out to the shops today should know that a fancy gadget with all the bells and whistles may be illegal. The GUI has stipulated that you can only use a device that measures distance and not wind, gradient or any other factor that might help you choose your club. On a sad note, the GUI has also announced the death of Desmond Rea O’Kelly, a Past President and Hon. Secretary of the Union. Honoured with the office of President for the GUI’s centenary in 1991, he served for 17 years as an officer of the Union, having also held the post of Honorary Secretary from 1975 – 1989. Prior to his year as President of the GUI, Des Rea devoted 33 years to golf administration for his club (Howth), the Leinster Branch of the GUI and for Central Council. Following his Presidency, he continued to be actively involved in aspects of Union life and attended Annual General Meetings until 2010. A highly successful architect, his best known work included a landmark building on the quays in Dublin, Liberty Hall. He is predeceased by his beloved wife Brenda, who passed away in the mid 1990’s. Reposing at The Kirwan Funeral Home, Fairview Strand. Requiem Mass on Monday 21st February at 11.30am in The Church of The Assumption, Howth. Funeral thereafter to Glasnevin Cemetery. E. Fayne (President), F. Buckley (President-Elect), A. Lee (Hon. Secretary), R. McClure (Hon. Treasurer), M. Connaughton (Chairman, Connacht Branch), K. McIntyre (Chairman, Leinster Branch), M. Cashman (Chairman, Munster Branch), I. McCandless (Chairman, Ulster Branch), J. McGovern (Hon. Secretary, Connacht Branch), J. Ferriter (Hon. Secretary, Leinster Branch), J. Moloughney (Hon. Secretary, Munster Branch), E. O’Connor (Hon. Secretary, Ulster Branch), S. MacMahon (Immediate Past President). President, Union Officers, Trustees, R. Canavan, (Connacht), J. McNamara (Leinster), L.Martin (Munster), P. Sinclair (Ulster). D. Murphy (Convenor), Union Officers, Junior Selection Committee, R. Cusack, J. Duggan, A Gibson, S. O’Leary. General Secretary (Convenor), J. Mooney (Connacht), N. McLoughlin (Connacht), M. Butler (Connacht), J. Long (Leinster), J. McNamara (Leinster), C. Maguire (Leinster), T. Donnelly (Munster), L. Harkin (Munster), B. Lynch (Munster), J. Boyd (Ulster), B. Hutchinson (Ulster), I. Smyth (Ulster). N. Bennett (Convenor), Union Officers, CONGU Reps, N. McLoughlin (Connacht), J. Mooney (Connacht), J. Clancy (Leinster), J. Ferriter (Leinster), M. Lawlor (Munster), T. Donnelly (Munster), T. Jones, D. McNeill (Ulster). J. White (Convenor), Union Officers, J. O’Donoghue (Connacht), E. Lonergan (Connacht), J. McNamara (Leinster), T. Thompson (Leinster), M. Cashman (Munster), K. Walsh (Munster), D. Montague (Ulster), K. Stevens (Ulster). M. Lawlor (Convenor), Union Officers, J. Mooney (Connacht), C. Madigan (Leinster), T. Donnelly (Munster), D. Irwin (Ulster). K. Flanagan (Convenor/Team Captain), J. Carroll, P. Hogan, K. Kearney, J. White. L. Martin (Convenor/Team Captain), C. McConn, A. Marsden, M.J. Murphy, R. Archibald. B. Doyle (Convenor/Team Captain), T. Basquille, T. Goode, R. McClure, J Moloughney. P. O’Dwyer (Convenor), Union Officers, N. McLoughlin (Connacht), B. Dunne (Leinster), M.P. Murphy (Munster), E. O’Connor (Ulster). F.W. Perry (Convenor), Union Officers, T. Basquille (Connacht), J. Ferriter (Leinster), J. Long (Munster), B. Mac M Ramsay (Ulster). B. Doyle (Convenor), Union Officers, General Secretary, Irish Senior & Youths Team Captain, Irish Boys Captain, Convenor Junior Golf, S. Fitzgerald (Connacht), J. Long (Leinster), J. Moloughney (Munster), B. Edwards (Ulster). S. Smith, C. Gannon, C. Madigan, M. Burns, T. Jones. F.W. Perry (Connacht), W. Skelton (Leinster), J.V. Lynch (Munster), R. Bell (Ulster). The Golfing Union of Ireland (GUI) and the Irish Ladies Golf Union (ILGU) are destined to merge and on Friday, both bodies took the first step towards the goal of having one governing body for golf by issuing a joint statement to say they will sit down to talk. Alan Dunbar with the St Andrews Links Trophy in 2009. Pic courtesy Bernie McGuireRathmore’s Alan Dunbar believes his hopes of making this year’s Walker Cup team have been damaged by what he described as a “stupid” decision by the Golfing Union of Ireland not to take up its option of four exemptions for this week’s prestigious St Andrews Links Trophy. The 21-year old, who won the St Andrews Links title two years ago, heads the betting for the East of Ireland Championship at Baltray today when he believes he should be trying to impress the R&A selectors alongside 13 members of the 16-strong Walker Cup squad at the Home of Golf. Five motions were passed at the Golfing Union of Ireland's Annual General Meeting at Carton House today. Several related to handicapping and a proposal by the Munster Branch that "no player can receive more than twenty point ones (0.1's) from qualifying competitions during a calendar year," was carrier and will now be proposed by the GUI to CONGU. The Golfing Union of Ireland has introduced an Emergency Loan Fund Scheme, to assist Clubs that have suffered damage as a result of the recent extreme weather.